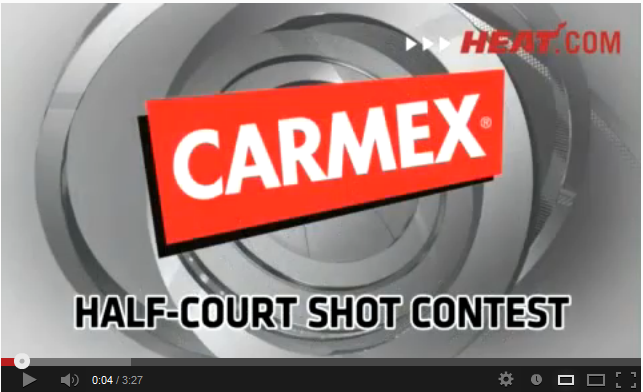 Carmex and the Half-Court Hero! Marketers know that the best campaigns contain various marketing tactics which are integrated for maximum exposure. Showing an advertisement is one way to gain exposure, but that is a push-feed at the consumer and doesn’t allow for any two-way interaction to build a relationship. However, adding other media such a contests and give-aways increases consumer interest and participation, as well as expands the brand’s image and exposure for a longer period. Case in point: Carmex lip balm and personal care products. In mid-2012, Carmex launched a sweepstakes called “Be a Half-Court Hero” offering consumers a chance to win a trip to Miami to see a NBA game and make a half-court shot to win $75,000, with another $75,000 donated to a charity. A long shot, sure, but for one lucky person it was the chance of a lifetime. In the end, the winning shot was shown on national news channels for several days – gaining incredible exposure for Carmex, Labron James, the NBA, and Miami Heat. Challenge your students to design a similar contest and see what they come up with to meet the challenge. 1. View the company’s Web site at www.mycarmex.com. 3. Divide students into teams and assign each team a product (i.e., detergent, gasoline, snack foods, etc.). Have each team design a contest or give-away that could be sponsored by a company. 4. What are the objectives of the contest? 5. How can the contest be integrated with various marketing tactics and social media. 6. How would students promote the contest and the results?